Cloudflare has launched a mobile app for its 1.1.1.1 DNS service. This makes it easier for smartphone users (on Android and iOS) to use. Cloudflare’s DNS service, which is designed to improve privacy and performance, can also be used on your desktop. What Is Cloudflare’s 1.1.1.1 DNS Service? In April 2018, Cloudflare launched its DNS service, catchily monikered 1.1.1.1. This is a DNS resolver that anyone can use for free. We previously detailed how to set it up on Windows and Mac, and explained how 1.1.1.1 solves some big privacy issues How Cloudflare DNS Helps Solve 4 Big DNS Privacy Risks How Cloudflare DNS Helps Solve 4 Big DNS Privacy Risks Cloudflare has released a new security tool that anyone can use for free. Cloudflare DNS helps improves security, privacy, and (potentially) speed. Read More . Using Cloudflare’s 1.1.1.1 DNS service should help you keep your browsing habits private from your ISP and other interested parties. It should also help improve performance, allowing you to load websites faster than you can using your ISP’s default DNS server. 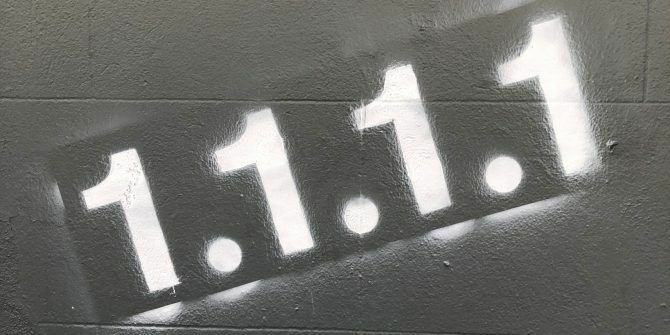 After a successful beta, Cloudflare has launched its 1.1.1.1 DNS service as a mobile app for Android and iOS. Cloudflare describes 1.1.1.1 as “the world’s fastest and safest DNS resolver” which is focused on a combination of privacy and performance. Once you install 1.1.1.1 you can turn it on or off with just a few clicks. When it’s turned on your internet usage will be funnelled through a secure connection. This makes sure no one can snoop on your DNS queries, whether it’s your ISP or the government. By making use of Cloudflare’s global network, the company claims 1.1.1.1 can improve your internet performance. Either way, 1.1.1.1 is free (for life), and Cloudflare promises to “never sell your data or use it to target ads”. Unlike some ISPs. Cloudflare’s app is far from the only DNS server available to use. We have previously detailed DNS servers guaranteed to improve your online safety 5 DNS Servers Guaranteed to Improve Your Online Safety 5 DNS Servers Guaranteed to Improve Your Online Safety Changing your DNS provider can dramatically improve your computer's defenses against online threats -- but which should you choose? We show you five DNS providers you can switch to today. Read More , and explained why it’s better to use third-party DNS servers 4 Reasons Why Using Third-Party DNS Servers Is More Secure 4 Reasons Why Using Third-Party DNS Servers Is More Secure Why is changing your DNS a good idea? What security benefits does it bring? Can it really make your online activities more secure? Read More . Still, 1.1.1.1 is another tool to add to your arsenal. Explore more about: DNS, Online Privacy, Private Browsing. Step 5: Praise your kid for learning a valuable skill. Hacking skills will get them far in life because they think outside the box. What is the difference between this and Google's Intra to the user, besides the obious use of their DNS?